The Leafs have made it known that they will take on bad contracts for picks and prospects. Players linked in rumours with the Leafs include Blackhawks winger Bryan Bickell and Carolina goalie Cam Ward. The Blues have spoken with Toronto to see if they'll take on Patrik Berglund, a serviceable NHL center who gets paid a bit too much. In the East the Rangers are clearly the most interested team and it doesn't hurt that his brother Marc plays for them. In the West it still sounds like Minnesota are the team to watch...Chicago was involved here but have almost certainly lost interest after adding Andrew Ladd, Dale Weise and Tomas Fleischmann these past few days. Some have thrown out St. Louis and Nashville as darkhorses. There may be other teams out there who see Staal as an option on the wing as opposed to his normal role as a centerman. 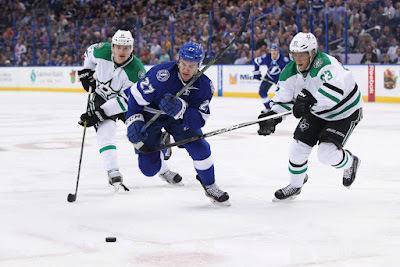 Drouin sweepstakes: Nichushkin for Drouin?